AOR, LTD is a Japanese communications equipment manufacturer established in 1978, headquartered in Tokyo, Japan, serves the monitoring enthusiasts, communication professionals, amateur radio operators and electronics industries throughout the world. A mew standard for hand-held receivers! ■ 100kHz〜1300MHz Analog & digital modes. ■ Optional COSPAS-SARSAT beacon decoder. 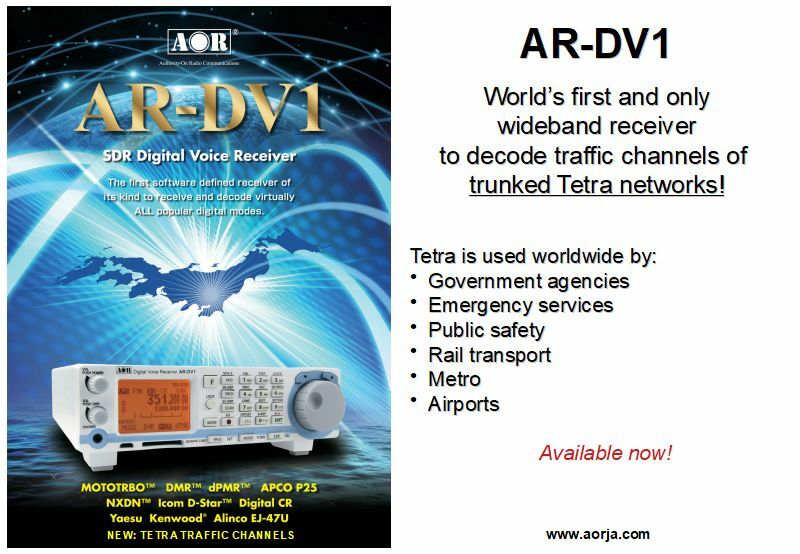 AR-DV1 World’s first and only sideband receiver to decode traffic channels of trunked Tetra networks! The future of radio monitoring. The AR2300 communications receiver from AOR is ideally suited for radio and spectrum monitoring in various commercial and government applications, as well as for use in radio investigation services. The AR2300 is an excellent choice for any applications requiring computer-control. Beginning of a new legend! The AR5001D from AOR is the most versatile Communications Receiver ever, since the release of a legendary AR5000 receiver! With ultra-wide frequency coverage and a host of operating features hatched by an advanced digital signal processing technology, you’ll be on top of the monitoring action with the AR5001D. Super wide-band 9kHz-6GHz, SDR architecture, ultra low-noise, zero-IF system, outstanding signal level correlation, up to 240h audio recording. Optional digital I/Q output, Apco 25 decoder, Ethernet controller, and rack-mount. On all frequencies, AR6000 provides excellent reception characteristics and can be used for signal analysis and signal strength measurement. Typical commercial applications are wide-area radio monitoring, interference detection and investigation, field-strength measurements, frequency analysis, radio propagation research, close range detection of illegal eavesdropping devices such as wiretap bugs and hidden wireless cameras. AR8200MK3 is the world-class all mode portable receiver with unparalleled frequency coverage from 500 KHz to 3 GHz with exceptional RF performance. Special Infra-Red display version for Night Vision Goggle is available for authorized government users. The AR8600 Mark2 is an amazingly versatile receiver which can be used mobile, base or trans-portable, powered from an external 12V D.C. power supply, 12V vehicle or from an optional internally fitted battery pack. A strong twin metal case with die cast front panel characterizes the multi-purpose role. The AR-ALPHA receiver provides a cost effective way to meet your signal intelligence or electronic warfare monitoring requirements. The IF bandwidth of the AR-ALPHA enables high speed I/Q recording directly through AR-IQ software to the hard-disk drive of any Dual-Core class PC operating under Windows. A new standard for hand-held receivers! Surveillance operations are enhanced. Monitoring multiple frequencies is easier and faster. Computer control gives you maximum flexibility and unleashes the many features found in the advanced technology receiver. The AR-ONE is the right choice for the new world we now monitor. The SR2200 is a computer-controlled compact black-box receiver measuring only 230 x 200 x 30mm. The SR2200 is a perfect choice for mobile application when operating with standard notebook PC. It is controlled by connection to a computer via an RS232 serial and USB rear panel connector. I/Q Recording Up to 1MHz Bandwidth! The AR-IQ software enables AR-ALPHA receiver to store and playback a full 1MHz of bandwidth activity without any loss of quality. Raw data can be easily transferred from the AR-ALPHA receiver to the hard drive of almost any dual core class PC operating Windows. The DA3200 Super Discone Antenna is an ultra-wideband antenna covering amateur radio, commercial 2-way, cellular, air traffic control and various utility frequency bands. Rust-free stainless steel is employed in major component parts making the antenna rust resistant and durable. The DA6000 is professionally constructed compact discone antenna for the upper UHF range of 700MHz to 6GHz. The top section comprises of 16 horizontal elements and the lower section has eight radials mounted on a solid stub terminated in an N-type connector. The SA7000 super wide range receiving antenna covers from 30 kHz to 2 GHz. This 1.8 m passive antenna has two vertical elements with a built-in duplexer. The antenna is designed for areas where space is a problem or when an unobtrusive installation is essential. LA800 is AOR's new outdoor shielded 80cm loop antenna. 6 bands tuning for optimal performance. A shielded loop antenna has the advantage, over non shielded ones, to be very robust against local noise from electrical devices. Remote tuning – The supplied 10m control and coaxial cables, separating the antenna from the control box, allow to conveniently operate band switching and fine tuning controls placed on the control box. While the control (tuning) box stays at hand’s reach, the loop element can be set away by using simple LAN and BNC coaxial cables. 5 position band switch to peak only on the wanted signal. Small size 30.5cm diameter loop with exceptional 20dB gain. Exceptional directivity in order to minimize the effects of local noise, the revolutionary LA400 offers, with its REMOTE TUNING SYSTEM, the perfect solution to keep the antenna away from noise sources by setting it up in quiet areas! Decode APCO P-25 Digital signals with an analog receiver. The ARD25 converts your analog receiver (if equipped with a 10.7MHz IF output) into digital receiver without any modifications to the receiver! The ARD25 will automatically recognize if the received signal is analog FM signal or a P25 digital signal. ARD9000 MK2 DIGITAL VOICE MODEM! The ARD9000Mk2 Digital Voice Interface lets you explore the world of digital communications with your existing transceiver. This device uses the same audio frequencies (300 - 2500 Hz) as microphone audio. Open published (G4GUO) digital protocol. No transceiver modifications necessary. DIGITAL VOICE & IMAGE ! Convert analog transceiver to Digital in one easy step! The ARD9800 is a modem unit that connects to the mic input of any transceiver. The user simply wires a connector for his particular transceiver, connects the speaker output of his transceiver to the modem and then connects the modem to a 12 VDC power source. Use analog transceiver to send encrypted digital voice & image. ARD9900 Digital Voice and Image Interface is a commercial, government, export version of the ARD-9800. Unlike the ARD9800, the ARD9900 features sophisticated voice encryption. This device uses the same audio frequencies (300 - 2500 Hz) as microphone audio. There are thousands of cameras hidden in public - Find Them! Sweep your home or office for wireless cameras and pick up their feeds instantly; perfect for counter surveillance. The ARL2300 Ethernet Controller is an option for the AR2300, AR5001D and AR6000 communication receivers, which allows remote control and remote listening through the network (LAN & Internet). It can be used for various professional or law enforcement related applications which demand interception of radio communications or radio wave monitoring from a remote location. The TFX-03 is the ultra-small ceramic SMD tuning fork crystal. Ceramic package and metal lid assures extreme accuracy and high reliability by the state-of-the-art EBS (Electron Beam Sealing). The micro-miniature size is suitable for time base applications operating from a 32.768kHz reference frequency. The TFX-02 is the miniature ceramic SMD tuning fork crystal. Ceramic package and metal lid assures extreme accuracy and high reliability by the state-of-art EBS (Electron Beam Sealing). The package size is very popular among with high-end consumer products. AOR offers the most popular SMD crystal for high-volume applications including AV, OA, and DIGITAL APPLIANCES in various markets. The ACU5032 measures only 5.0 x 3.2mm allows for easy placement in dense circuit. AOR offers 6.0 x 3.5mm classical SMD package that have been used in many applications over a decade. Pure Japanese Made high-precision, high-quality SMD crystals are available in wide frequency range with custom retrofit parameters. AOR offers 7.0 x 5.0mm classical SMD package that have been used in many applications over a decade. Pure Japanese Made high-precision, high-quality SMD crystals are available in wide frequency range with custom retrofit parameters. MCF features high quality quartz resonators such as sharp cutoff characteristics, low loss, good inter-modulation and high stability over wide temperature range. The ACF7050 MCFs covers 21.4MHz to 130MHz range with superb attenuation. AOR offers high performance monolithic crystal filters in popular through-hole metal package for the frequency range up to 120MHz region. Metal jacket, lead forming and T/R options are available. AOR offers extensive sourcing service and custom design on crystal units, filters and oscillators in various packages and specifications. Cross reference to other manufacturers and alternative product sourcing are always welcome. The AR-DV10 hand-held digital receiver is water resistant as per IPX5 rating. No need to worry about water splashes or sudden rain! The Serious Choice in Advanced Technology Receivers! Store and playback a full 1MHz spectrum without any loss of quality. DA3200 - The ultra-wideband discone antenna. DA6000 - UHF/L/S/C discone antenna for professionals. MA500 - Magnetic mount mobile whip antenna. SA7000 - Super wide band base antenna system. 5 band selectable between 150kHz and 30MHz, precisely tuneable for best receiving experience. Shift the aligning point slightly to attenuate unwanted signals while amplifying the wanted signal. The LA800 Super Loop antenna 10kHz-500MHz. The LA400 Indoor Magnetic Loop Antenna. MC-600 Impedance Matching Transformer for antique receivers with 600-ohm input. ARD25 APCO P25 Digital signal decoder for analog receivers. ARD9000 MK2 Digital Voice Modem for existing transceivers. ARD9800 Digital voice and image interface. Wireless camera detector for security professionals. Compatible with NTSC/PAL video format. The JAVA based client software of the ARL2300 Ethernet controller allows LAN/WAN remote control of your AR2300/5001D/6000 receiver. Empower your receiver with network control! AOR offers TFX-03, the most popular tuning-fork 32.768kHz crystal in an innovative ultra small package, measuring only 2.0 x 1.2 x 0.6mm. AOR offers TFX-02, the most popular tuning fork 32.768kHz crystal in a popular 3215 size small package. AOR offers the most popular SMD crystal in 5.0 x 3.2mm package that allows for easy placement in dense circuit. AOR offers 6.0 x 3.5mm popular size SMD crystals that have been used in many applications. Standard frequencies and custom specifications are available. AOR offers 7.0 x 5.0mm popular size SMD crystals that have been used in many applications over a decade. ACF7050 MCFs covers from 24MHz to 130MHz range with superb attenuation in miniature 7.2 x 5.0mm package. AOR offers high performance monolitic crystal filters in popular through-hole metal package for the frequency range up to 120MHz. High frequency miniature SMD oscillators. CMOS, PECL, LVDS in various frequencies and custom specifications. AOR offers extensive sourcing service and custom design on crystal units, filters and oscillators for various frequencies and packages. Please call us for prompt quote! World’s first wide-band communication receiver with frequency coverage up to 6000MHz, based on revolutionary broadband reception and digital signal processing technology introduced with the AR-ALPHA, AR2300 and AR5001D receivers. Continuous coverage from 9kHz to 6GHz! 2019.04.17 Addition of TRUNKED TETRA (traffic channel) decoding to the AR-DV10 firmware. Have fun! 2019.04.03 Have fun experimenting with your AR-DV10 receiver: Connect it to another (non-digital decoding) AOR receiver and use it as an external digital decoder! Details *here*. AR-DV1's new trunked Tetra decoding feature has been reviewed in the Japanese RADIOLIFE magazine edition 2019/03. The English transcript can be downloaded *here*. 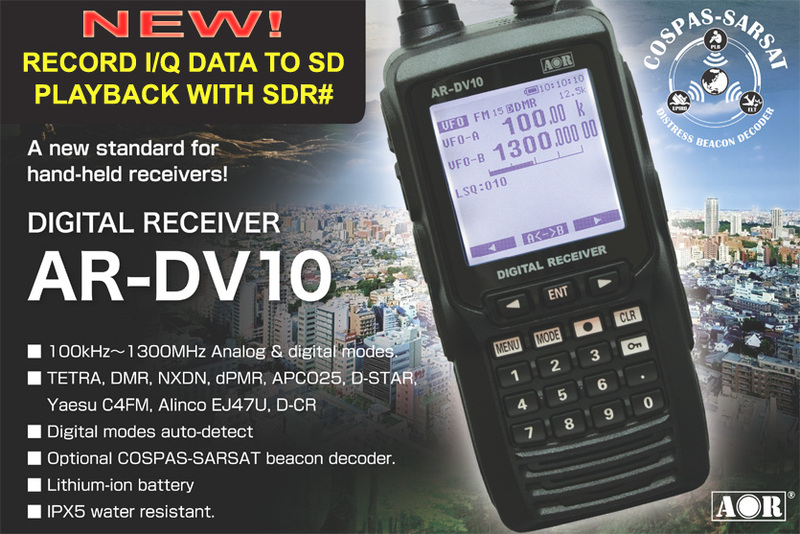 Courtesy of SANSAI BOOKS Ltd.
2019.01.22 The AR-DV1 DIGITAL VOICE RECEIVER is now the world's first and only wideband receiver to decode traffic channels of trunked Tetra networks! Tetra is used worldwide by government agencies, emergency services, public safety, rail transport, metro, airports, etc... Speaking of airports, there is an official list of airports where Tetra is used, available on the Nippon Airport Radio Services website *here*. The list is somewhat outdated; now it's up to you to power up your AR-DV1 DIGITAL VOICE RECEIVER and find out if your local airport uses Tetra or not. Enjoy the monitoring! - Log recording and playback via a new PC utility. Go to the firmware download page. 2018.12.21 Addition of a new exciting digital mode to the AR-DV1 firmware. Details *here*. MERRY X-MAS! 2018.10.05 AR-DV10 is getting even better! With today’s new firmware release 1810A, we are introducing a revolutionary new feature, a lot of improvements and bug fixes. AR-DV10 is now able to record I/Q bandwidth directly to SD card! It’s actually the first and only hand-held receiver on the market able to do this. In other words, record bandwidth out in the field, and play it back later on your PC with the popular software SDR#. For details, check the AR-DV10 manual addendum pdf *here*. 2018.05.14 We proudly present the release of the new AR-DV10 DIGITAL RECEIVER! This sets a new standard for hand-held receivers as it decodes virtually all popular digital modes and is the first wide-band receiver in the world to feature an optional COSPAS-SARSAT distress beacon decoder! 2017.09.08 As you know we had our exhibition at HAMFAIR 2017 in Tokyo on Sept.2nd and 3rd, where we presented 3 new products to come for 2017-2018. This year’s Hamfair was particularly popular as the official number of visitors was 36,000 for two days! That was a very successful show for AOR where our team had the opportunity to present exciting new receivers, and share opinion and ideas with many radio enthusiasts and communication professionals from all around the world. Here are a couple of pictures to illustrate the event. 2017.09.02 Here is a teaser on the new products for 2017-2018 which will be presented at the HAMFAIR taking place today and tomorrow. Please note that these products are still under development, therefore the exact release dates will be announced at a later time. 2017.08.28 As every year we are pleased to exhibit at the HAMFAIR in Tokyo-Japan, which will take place on September 2nd and 3rd. This year we are particularly excited as we are celebrating our 40th anniversay! Please come to visit us for new product presentations! Location: Booth B-06 at TOKYO BIG SIGHT. 2017.05.24 Undocumented features for AR-DV1! Our “advanced users” will be interested in the following two features of the AR-DV1 Digital Voice Receiver! NXDN DESCRAMBLE and DISCRIMINATOR DIRECT RECORDING on SD. 2015.07.24 We are proud to announce the worldwide release of the AR-DV1 SDR Digital Voice Receiver! It’s the first software defined receiver of its kind to receive and decode virtually ALL popular digital modes. Mototrbo, DMR, dPMR, APCO 25, NXDN, Icom D-Star, Digital CR, Yaesu, Kenwood and Alinco EJ-47U. *All trademarks remain the property of their respective owners. 2014.04.04 The Raspberry Pi software package for AR8600MK2 control is ready! (see previous announcement below) For setup instructions, click here. For the software package, click here. 2014.03.31 AOR loves the RASPBERRY PI! Do you own a AR8600MK2 receiver, a Raspberry Pi, and know your way around Linux/Raspbian? Then you are just one step away to connect your trusted legacy receiver to your LAN and the Internet! We love the Raspberry Pi board for the great possibilities it offers, and just for the sake of experimentation we have created a simple server/client program which allows you to remote control AR8600MK2 through LAN & Internet. It’s experimental, without official support, it’s fun, but most importantly it’s FREE! The setup instructions and the necessary data files will be available for download soon! 2014.02.20 AR8200D, the "ENHANCED" version of the legendary AR8200MK3 hand held receiver, is high-lighted on the cover of the March edition of UK's RADIOUSER magazine! It features an extensive review by Mike Richard, be sure to check it out! 2013.12.19 AOR is proud to become the international distributor for PTEK LAB's DIGITAL TV SIGNAL ANALIZER! 2013.11.13 ARD300 MULTI-DIGITAL VOICE DECODER now available! Decode dPMR, D-STAR, APCO25, NXDN, Yaesu & Alinco digital, Digital-CR with your analog receiver! 2013.10.22 AOR now member of the dPMR Association! AOR always strives to integrate new technologies in its line-up, in order to enhance the listening experience of our dear customers. and excitement to the hobby listening world! and is a 25MHz wide analog IF to digital I/Q converter. 2013.05.29 AR6000 (6GHz) receiver now officially released! hand-held receiver AR82000MK3 -------> AR8200D! For more details, check out the manual for AR8200D! Refer to the accessory table to see which accessories can and can’t be used with this new version. with frequency coverage from 9kHz to 6GHz! 2013.01.22 We are very pleased to announce the release today of our new OUTDOOR LOOP ANTENNA LA800 (10kHz-500MHz)! LA800 is a large (80cm loop) outdoor version of LA400. successor of the previous LA380 and LA390. 2012.02.24 Important information for AR8200MK3 Handheld receiver customers. 2011.07.22 We are please to announce the release today of the long awaited ARL2300 ETHERNET CONTROLLER option for the AR2300 and AR5001D receivers! ARL2300 allows remote control and remote listening through LAN and the Internet. 2011.07.22 New Controlsoft version 1.0.2.7 available for AR2300/AR5001D with memory channel bug fixed! Catch AOR Ltd. at the JARL HAM FAIR located at Tokyo Big Sight, on August 27-28, 2011.
with the ARL2300 LAN BOX, and the Android-Tablet based client ap! (Ap under development).